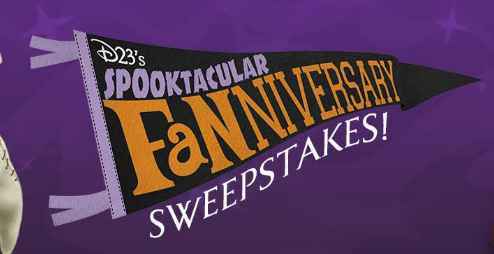 Disney Worldwide brings you the D23 Spooktacular Fanniversary Sweepstakes where they will be giving away ultimate Funko Fanniversary prize pack filled with 25th Anniversary Edition Tim Burton’s The Nightmare Before Christmas Funko collectibles and much more exciting prizes. How To Enter: Go to this link:D23.com/fanniversary during the sweepstakes period and follow the online instructions to register by entering all information requested on the registration form and once you filled out the entry form now Click on the submit button to complete the registration form. Prizes: Four lucky Prize winners will win Funko Fanniversary prize pack filled with 25th Anniversary Edition Tim Burton’s The Nightmare Before Christmas Funko collectibles and much more exciting prizes. When To Enter: The D23 Sweepstakes entry begins at 12:00 am PT, October 1, 2018 and ends at 11:59 pm PT, October 28, 2018. Who’s Sponsor: The Sponsor of this Sweepstakes is Disney Worldwide Services, Inc., dba D23 Worldwide, 500 S. Buena Vista Street, Burbank, CA 91521-8394.